Recently I was contacted by Adams Media publishing about reviewing two new books. The first book (the second will be a post in the near future) is DIY Mason Jars: Thirty-Five Creative Crafts and Projects for the Classic Container by Melissa Averinos. I know I am not alone when I say that I love Mason jars! What's not to love? They are versatile, easily accessible, and exude a classic charm. I know I have had tons of food crafting fun with them~here, here, and here. A rainbow was the logical cookie choice, complementing the blue sky and arching over the mouth of the jar just right. My rainbow inspiration came from some adorable graphics by the crazy talented Amy, of Living Locurto. I am a huge fan of her creations! Isn't the color combination of this rainbow pretty? Wow Sue...you've got an eye for making things so "darling!" I love how you put this together! Sue, this is so adorable! I love Mason Jars too Sue. 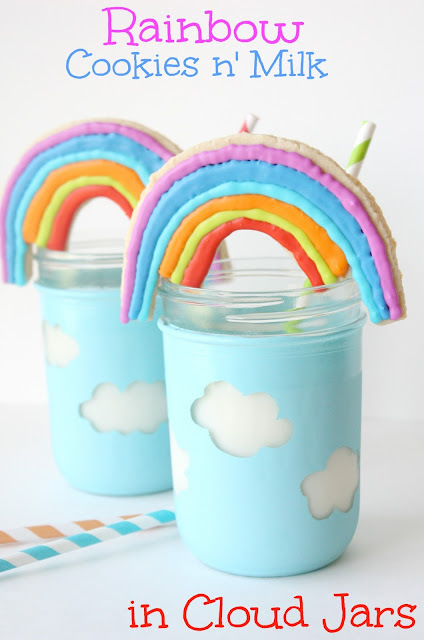 Those clouds on the jars are so cute and the rainbow cookies on top are adorable. I think the whole idea is just darling like everything you do! These jars are super cool and I love how you came up with the beautiful rainbow cookie to compliment them. Sounds like a fun book (Adams Media published Sweets on a Stick too). These are so darn cute! And I love the cloud jars too. Fun! So cute and the jars are fabulous. I love your header too. These are so amazingly cute! Sure to brighten any day! Some where over the rainbow!!!! Gorgeous. These are exquisite, Sue! The minute I opened the page, I think I stared for a good 5 minutes! I'm waiting for your cookie book to come out - seriously? :) I definitely want to do these for my kids (knock wood) one day! These are possible the cutest cookie ever! Love them!